In this short article I would like to explore the modality of chatbots or cognitive assistants. At the present moment in time there is a wide range of platforms for schools, colleges and universities to choose from. A chatbot could be deployed on a traditional website, a messenging platform, as an app on a smartphone or it can be accessed via a smart speaker. The choices made by the educational institution will have a bearing on the way students, teachers and support teams engage with the service and what can be garnered from the chosen medium. Let's examine the choices made by colleagues at Bolton College. How has Bolton College deployed its chatbot service? The students at Bolton College can access the Ada service via their student home page as a webchat window. When a student types a question the Ada service is able to present a rich set of information back to the student. The choice of medium was important for the College because much of the information on the campus is a rich composite of images, links and videos. Students can also access the service via any web browser on their mobile devices. The following image shows the Ada webchat window on Bolton College's student home page. The ability to garner a rich set of information is particularly useful when supporting teaching, learning and assessment. 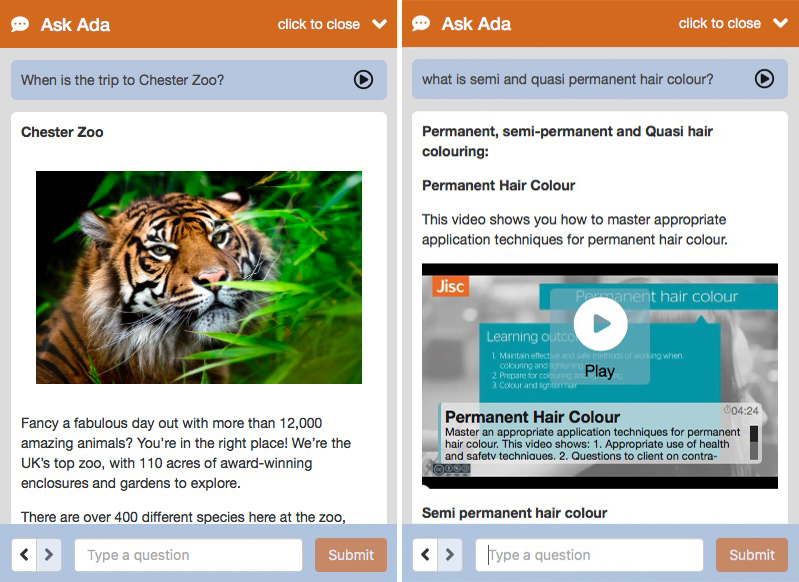 Teachers, can curate engaging content and students can access materials to support their studies with ease. Likewise, students can ask for basic information regarding timetables, their exam schedule, events around the campus and more. The ability to offer contextualised and personalised responses to individual students is an important element to any chatbot or voice first service. Following on from an early prototype of Bolton College's Ada iOS app, the College's learning technology team will produce, test and deploy iOS and Android apps for its Ada chatbot service in the coming academic year. The mobile apps will enable students to use voice and text input and the app will respond with voice and multi-media output. The ability to deploy the Ada chatbot to mobile will provide additional opportunities for students, teachers and support teams to access the service. Accessing the Ada service via smart speakers will no doubt follow; and they will be a valuable addition to the campus for students and visitors to the campus. However, we need to be mindful that the devices may not be linked to a screen; and the responses from the Ada service will need to reflect this.